Helping Kids with Autism Spectrum Disorders Fit In & Shine! Therapeutic recreation incorporates recreation activities and social skills therapy into one engaging and effective program. Children learn and practice the socials skills necessary to enjoy outings with family and friends — as well as other typical social activities and situations at school and in the community. MUST BE A CURRENT CLIENT OR HAVE BEEN A SOCIAL SKILLS GROUP CLIENT WITHIN THE PAST TWO YEARS TO ENSURE THAT WMLC IS PREPARED TO MEET THE NEEDS OF ALL PARTICIPANTS. One of our most exciting and popular activities for kids ages 8 and up! Once-a-month group sleepovers provide an awesome opportunity for kids to connect, hang out and socialize. Community outings are offered during select sleepovers. Bowling, BBQs, swimming and going out to eat are a few examples of past sleepover activities. Sleepovers provide guided and facilitated therapeutic education to improve self-management skills and promote responsibility. REGISTRATION CLOSES ONE WEEK BEFORE THE SLEEPOVER DATE. Hang out with friends on Fridays! Social interaction and communication with peers is facilitated by our highly trained staff. Each participant will receive a completed feedback sheet used to monitor your child throughout the evening. Summer: Drop-off at 10 a.m., Pick up at 4:00 p.m.
Sign-up early to guarantee your spot…online registration is now available for sleepovers! Registrations must be confirmed to be valid. 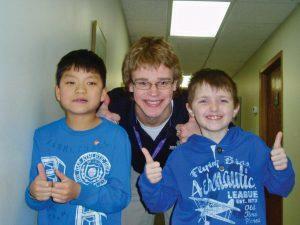 West Metro helps kids build social skills and develop friendships. Join our mailing list for information on our classes, services and events!